The global economic downturn may fuel human trafficking because it exacerbates many of the root causes, including poverty, gender inequality, and the demand for cheap labor. As unemployment rates climb, many people are driven into increasingly vulnerable positions. There is already evidence that traffickers are exploiting this as vital remittances and legitimate labor opportunities shrink. 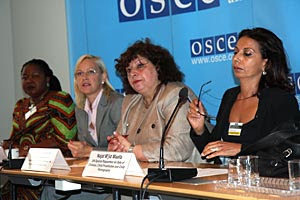 To explore this link, the OSCE organized a high-level conference that opened in Vienna on September 14th. The conference focuses on prevention and examines the ways in which a declining global economy is likely to exacerbate human trafficking. According to US Secretary of State Hillary Rodham Clinton, who opened the conference with a video address, "new economic pressures are likely to aggravate the problem further, so this conference comes at a time of renewed urgency. It is an opportunity to place a renewed focus on prevention and the root causes of trafficking. Together we must implement a comprehensive approach that both confronts criminals and cares for survivors." We won't, of course, hear anything from Secretary Clinton or President Obama about globalization, the main engine driving poverty and displacement in the developing world. Free Trade is neocolonial theft, globalization is mass murder, and the Obama/Clinton team are leading both.